A widowed f ield mouse is in deep sadness as one of her youngsters falls ill. To save little Timmy she must be very brave and travel to find help to move their home out of the way of the plow. One of the most dangerous beings that she will have to visit is the Great Owl, which most people know that owls eat mice. Will she be able to save her children as well as her home? What really happened to the mouse she loved? 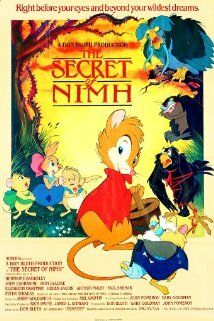 All of these things and more will be answered as you watch The Secret of NIMH. To learn more, you should check out http://www.imdb.com/title/tt0084649/?ref_=sr_1. The movie gets a five out of five popcorns rating.